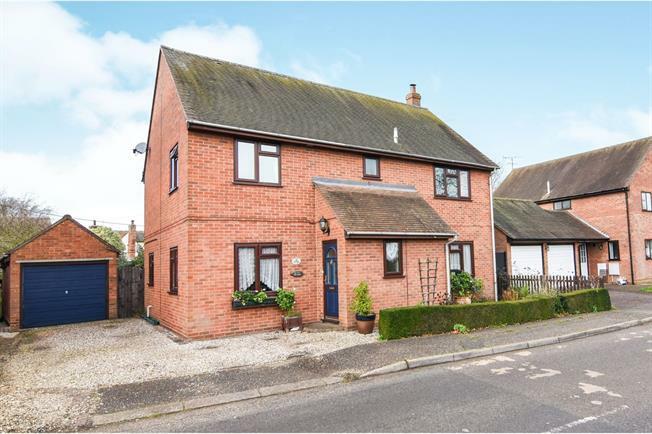 4 Bedroom Detached House For Sale in Braintree for Guide Price £450,000. An imposing detached family home with four double bedrooms, two great size reception rooms, solid oak kitchen and the choice of three bathrooms. This executive style home offers space for a large or growing family with well thought out accommodation over two floors. The large and mature rear garden is typical of a rural Essex Village, with a large entertaining patio leading away from the property followed by areas of lawn and shrubs perfect for the vast array of visiting wildlife. Separate to the formal part of the garden is an area for the good life! Including a greenhouse, shed and vegetable garden. To the side of the property there is a single detached garage and driveway for at least two cars. The hardwearing flagstone tiles offer an attractive and practical flooring to the entrance hall, which leads through to all of the ground floor rooms. The large sitting room is the full depth of the property and is bathed in light from the window at the front and French doors leading to the garden. The main feature of the room is the wonderful open fireplace with ornate surround and hearth. The dual aspect formal dining room, is an elegant setting for hosting diner parties or family dining. With more than enough room for a family sized dining table and chairs it is the perfect place for eating or entertaining. A remarkable feat of craftsmanship! The bespoke solid Oak kitchen offers a range of cupboard both at eye and base level, complimented by a granite work top. The butler sink is set within the counter, which also makes room for a breakfast area with stools under. The double oven and hob are integral to the units. A welcome addition to the family sized home is the separate utility room, offering additional space for a washing machine and tumble dryer. There is also a rear door leading through to the garden. An important part of any family home is the ground floor WC, with a wash hand basin and low level toilet. The large Master Bedroom has far reaching views from both of the windows across the park and woodland beyond, there is ample room for bedroom furniture and also as the benefit of its own bathroom. The extended and modernised En-Suite shower room has a double shower enclosure, low level toilet and pedestal wash hand basin, complimented by contemporary tiling. Located at the front of the property, again with far reaching views, this generous size double bedroom has more than enough room for a King size bed and furniture. At the rear, the third double bedroom has a quiet position overlooking the garden, currently used as a craft room due to the size, peace and tranquillity of the room. Unusually the fourth bedroom is also a double, again at the rear of the property overlooking the garden. The white modern, three piece bathroom suite comprises; low level WC, panel enclosed bath and pedestal wash hand basin. The large and mature rear garden is typical of a rural Essex Village, with a large entertaining patio leading away from the property followed by areas of lawn and shrubs perfect for the vast array of visiting wildlife. Separate to the formal part of the garden is an area for the good life! Including a greenhouse, shed and vegetable garden. To the side of the property there is a single detached garage and driveway for at least two cars.